Due to busy and hectic schedule, people suffer from the complaints such as neck rigidity. Persons who work with machines, heavy objects, computers are more prone to the stiffness of the neck. 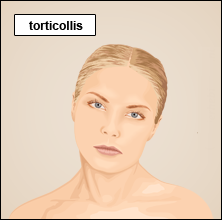 Torticollis is a condition that involves twisted and tilted neck. In this condition, the top of head tilts to one side while the chin tilts to another side. This condition can be congenital or acquired. It can also result due to the damage to the neck muscles or lack of blood supply. This condition sometimes goes away on its own without any treatment. But, there are chances of relapse. It is also known as acute torticollis or permanent torticollis. It is usually caused due to a problem with the muscular or bone structure. This rare disorder is sometimes referred to as spasmodic torticollis in which there is a contraction in neck muscles. The head twists or turns painfully only to one side. It sometimes goes away on its own without any treatment but there is a risk of recurrence. WHAT ARE THE CAUSES OF TORTICOLLIS? Torticollis may be an inherited condition which can also develop in womb due to the baby’s head in the wrong position. It also occurs due to muscle or a nerve injury. Sometimes the cause of Torticollis is not known. This is referred to as Idiopathic Torticollis. In children, neck may appear flattened and unbalanced and also have motor skill delays or difficulties in hearing or vision. X-ray and MRI scanning are done to rule out the exact mechanism and possible extent of the diseased condition. Torticollis can be compared to Manya Stambh in Ayurveda. It means that there is a stiffness in the neck region and imbalance of Vata dosha which is responsible for this condition. Due to certain factors such as heavy exercise to the neck and shoulder, direct neck injury, using a hard or a thick pillow, keeping the arm beneath the head while sleeping, pulling heavy objects forcefully etc. the joints, veins and nerves get fatigued or lose their tension. The vitiated Vata gets blocked in the neck location and as a result, stiffness is caused. 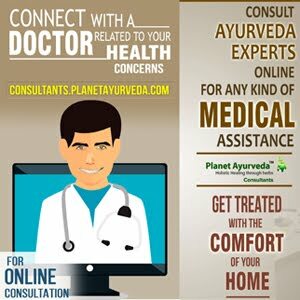 Planet Ayurveda offers various herbal remedies which are 100% pure, natural and vegetarian and free from chemicals, additives as well as preservatives. 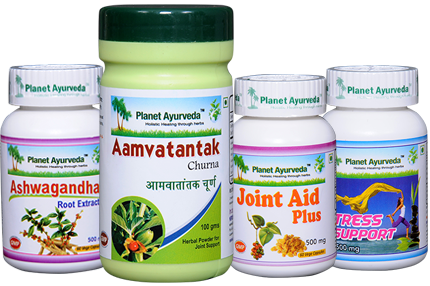 Aamvatantak Churna of Planet Ayurveda is a purely herbal formulation which contains various herbs. These herbs are anti-inflammatory analgesic, anti-oxidant and immunity booster in nature which reduce the pain, tenderness, inflammation of the joints and also give relief. This herbal powder helps to maintain the health of the joints of the body. This churna also helps in managing the ‘Ama’(endotoxins) in the body and pacifies Vata dosha effectively. Thus, this powder is very effective in the treatment of torticollis. Ashwagandha Capsules of Planet Ayurveda are prepared from the standardized extract of the herb Withania somnifera. These capsules provide all sorts of benefits for the body as well as brain. This herb has been used for over 3,000 years to relieve stress, increasing the energy levels, to improve the muscular functions. It provides strength to the muscles, increases the natural killer cell activity and also decreases the markers of inflammation. Hence, these capsules are very effective in the treatment of torticollis as well. Joint Aid Capsules of Planet Ayurveda are prepared from the standardized extracts of herbs which are considered as anti-inflammatory in nature. These herbs act in a synergistic manner that control the acute and chronic inflammatory reactions. Stress Support Capsules of Planet Ayurveda are prepared from the standardized extracts of various herbs that help in balancing Vata dosha in the body. The herbs in this product act synergistically to control the vitiated Vata dosha therefore acting on the root cause. Do not try to exercise the neck in the initial stages as it will make it more painful. Hot water bath is recommended as compared to cold bath but if the stiffness is associated with pain, then applying cold ice pack provides relief. Apply oil and do gentle massage for 10 minutes before bath to the entire part of the neck and then take hot water bath. Avoid the intake of curd, unctuous substances, fried and oily food, dry substances, late night awakening. Avoid heavy exercise and exertions.